We carry Right-to-Know Safety Bottles which are color coded and clearly labeled for the corresponding chemical's within any cleanroom. 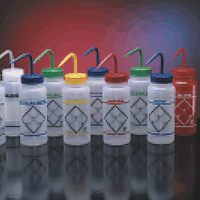 We also sell multiple forms of ESD Safe, Static Control Bottles with styles ranging from round storage bottles to spray bottles and bottles with anti-splash pumps. If you don't see what you're looking for on the website please don't hesitate to contact us here and we'll let you know about any other options / styles / sizes available.